We talked some weeks ago about Patrick Ewing's hopes of becoming a head coach. 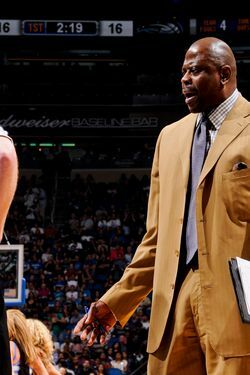 Ewing has spent the last decade or so as an assistant coach, first with Washington and, currently, with the Orlando Magic. Over that span, he's made no secret of the fact that he'd like to become the head dude somewhere. For some reason, though, Ewing has drawn very little interest around the league and absolutely none from the Knicks, an organization crawling with former players of much less esteem. Whatever the hang-up may be, Ewing spent this season broadcasting his interest in a head-coaching position, and today marks his first opportunity in a while to pitch for one. It's been rumored for a few weeks that the Charlotte Bobcats would consider Ewing as a replacement for the recently departed Paul Silas. Indeed, they are reportedly interviewing Ewing (intervi-Ewing!) today, perhaps at this very moment. He'll be in competition with several other assistant coaches, including Memphis's Dave Joerger and the logical/biological heir to the throne, Stephen Silas. Starting off a head-coaching career in Charlotte would be the very definition of working one's way up. The 'Cats, as you may recall, registered the lowest regular-season winning percentage of all time this season, so it's the rebuildingest of rebuilding projects. (Then again, a job where a 20 percent success rate qualifies as improvement has some appeal). It'd also be pretty funny for Ewing's first head-coaching money to come from the pocket of former nemesis (but current friend) Michael Jordan. Well, at least they tell me Jordan used to be Ewing's nemesis — apparently he had a bit of a career before purchasing the Bobcats? Best of luck to Pat, who's surely gained some coaching chops in his years working under Stan Van Gundy. The man wants very badly to lead a team, and we hope he finally gets his chance at it somewhere.